People who really want to protect the value of their smartphones know that doing so ensures they’ll get as much money as possible when it comes time to sell their phones and upgrade. Of course, they also know that a protective case alone will never do the trick. Screen protectors are just as important so that you make sure your display doesn’t scratch or crack, and now is the perfect time to make sure your iPhone is protected. 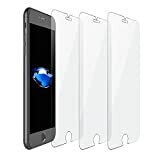 From now through the end of the day on Monday, Amazon is offering 3-packs of iOrange-E Tempered Glass Screen Protectors for the iPhone 7 or iOrange-E Tempered Glass Screen Protectors for the iPhone 7 Plus for just $6 using the coupon code GHUMCPDX. That drops the price to just $2 per screen protector, which is pretty much unbeatable.